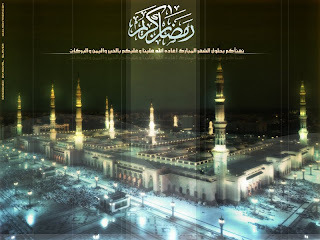 Marwa Ayad - The Official Website: Ramadan Mubarak! Ramadan has always had a very special place in my heart; mostly because of the serenity and peace that seem to fill the air all around; after all, devils and rebellious jinn are "chained" during that holy month. That's why it's believed if a person commits a sin during Ramadan, it's because of their own weakness and corrupted self (having been accustomed and addicted to sin...etc.). The Prophet said, "Whoever does not give up false statements (i.e. telling lies), and evil deeds, and speaking bad words to others, Allah is not in need of his (fasting) leaving his food and drink" (Bukhari). He also said, "If one of you is fasting, he should avoid sexual relation with his wife and quarreling, and if somebody should fight or quarrel with him, he should say, 'I am fasting'" (Bukhari). O ye who believe! Fasting is prescribed for you, even as it was prescribed for those before you, that ye may ward off (evil) (2:183). Ramaḍān is a time to fast for the sake of Allah, and to offer more prayer than usual. Muslims also believed through good actions, they get rewarded seventy times as much as they normally can achieve. During Ramaḍān, Muslims ask forgiveness for past sins, pray for guidance and help in refraining from everyday evils, and try to purify themselves through self-restraint and good deeds. As compared to solar calendar, the dates of Ramadan vary, moving forward about ten days each year. Ramadhan was the month in which the first verses of the Qur'an were revealed to the Prophet Muhammad. The elderly, the chronically ill, and the mentally ill are exempt from fasting, although the first two groups must endeavor to feed the poor in place of their missed fasting. Also exempt are pregnant women, women during the period of their menstruation, and women nursing their newborns. While fasting is not considered compulsory in childhood, many children endeavor to complete as many fasts as possible as practice for later life. Lastly, those traveling are exempt, but must make up the days they miss. A person who is observing Ramadan might break the fast accidentally, due to having forgotten it. In such an instance, one should spit out the food being eaten or cease the forbidden activity, immediately upon remembering the fast. Laylat al-Qadr, considered the most holy night of the year, is the night in which the Qur'an was revealed to Muhammad, the "Night of the Power". Muslims believe it to have occurred on an odd-numbered night during the last 10 days of Ramadan..
"The Night of Power is better than a thousand months. The angels and the Spirit descend therein, by the permission of their Lord, with all decrees. (That night is) Peace until the rising of the dawn." Ramadan ends with Eid ul-Fitr, with much celebration and feasts. During the month following Ramadan, called Shawwal, Muslims are encouraged to fast for a further six days, known as as-Sitta al-Bīḍ, or "the white six." When fasting is over, Muslims go to Mosques in new clothes to pray the first Eid prayer. They give out presents to the young ones and greet their friends and families. They then thank God for what He has given them. Wishing all my Muslim friends worldwide a happy, blessed Ramadan insha'Allah. May Allah guide us towards making this Ramadan a source for gathering numerous blessings and getting our major and minor sins forgiven. Ameen.